floating ice formed in lakes. 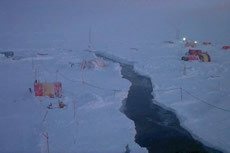 a layer or body of unfrozen ground occupying a depression in the permafrost table beneath a lake. thin plate, sheet or layer; laminae (plural). the relatively dark appearance of the underside of a cloud layer when it is over land that is not snow covered; this term is used largely in polar regions with reference to the sky map; land sky is brighter than water sky, but is much darker than ice blink or snow blink. the rate of change of any meteorological element with height. atmospheric processes with a representative scale (large-scale) of 10,000 kilometers (6,200 miles); in meteorology, it is a scale in which the curve of the earth is not negligible; the large-scale atmospheric flows are essentially nearly hydrostatic, nearly geostrophic and wave-like in appearance; they exist mainly in response to the latitudinal differences in radiative heating, to the particular value of the coriolis force and to the spatial distribution of the oceans and continents. the amount of heat required to cause a change of phase from solid to liquid, or the heat released when the phase change is from liquid to solid; in the case of melting snow, the phase change from ice to water requires a significant amount of heat160 times that required to raise the temperature of the same amount of ice by just 1 degree Celsius; until the required amount of heat is supplied to completely melt all of the ice being considered, no further increase in temperature will occur. a polynya that forms from strong winds in a persistent direction that push the ice away from a barrier (the coast, fast ice, a grounded iceberg, or an ice shelf). a ridge-shaped moraine deposited at the side of a glacier and composed of material eroded from the valley walls by the moving glacier. a layer or body of unfrozen ground, overlain and underlain by perennially frozen ground. the southernmost (northernmost) latitude at which permafrost occurs in a lowland region in the northern (southern) hemisphere. the subdivision of a permafrost region into permafrost zones, based on the percentage of the area that is underlain by permafrost. the cryostructure of frozen silt or loam in which ice layers alternate with mineral layers that have a massive cryostructure. long, linear areas of open water that range from a few meters to over a kilometer in width, and tens of kilometers long; they develop as ice diverges, or pulls apart. a lead that forms between drift ice and the coast. ground ice occurring as ice lenses. the cryostructure of frozen silt or loam containing numerous ice lenses. floating ice with a flat surface which has never been hummocked. general term for dry atmospheric suspensoids, including dust, haze, smoke and sand. the failure strength of a material after a long period of creep deformation. heat radiation with wavelengths greater than 4 millimeters. area of low pressure in the atmosphere. an ice-wedge polygon in which thawing of ice-rich permafrost has left the central area in a relatively depressed position. clouds in the lower region of the atmosphere, from ground level to 6500 feet (2000 meters); includes stratus, stratocumulus, the bases of cumulus and cumulonimbus, and sometimes nimbostratus clouds. white or sometimes reddish vertical streaks of light extending from above and below the sun; they are caused by light reflected off the mirror-like surfaces of ice; most commonly seen at sunrise and sunset.